Two strategies for Peach's side-smash and down-B that you can take as seriously as you care to. This is a combination of an optimization technique ("Knitting") and a few general rules for turnip use to maximize the benefits gained by it. The second step will Q drop the turnip via R/L + A. The third part involves pressing the same buttons again, this will be the grab, of course you don't need to jump to grab, but it is much easier to mash jump+A twice than to replace the last step with simply A. Try it and you will see what I mean. Ok, ok, it is not necessarily grabbing while holding a turnip, she has to drop it first, but its next fastest thing, and the z dropped turnip can sometimes hit the opponent before or during the grab. Quetz's Old School method (Y>Y+Z) is the easiest to start with when getting an idea of the qdrop timing. Just mash the second X/Y and Z at what you perceive to be the 'same time'. This method gives you a mix of 7/10/13 (YYZ) and 10/12 (YZY) qdrops depending on if Z or Y/Z is input first. It is pretty random, but personally I seem to get mostly YYZ qdrops when doing this. Not sure who first discovered this set of inputs or when it was, but it was documented and sent to me by @radiogiraffe on /r/ssbm. The inputs are the same as the Rush song and is the most optimal way to knit. Y>Y>Z [is] 3 frames faster. Also easier in technique and having a 3 frame window to input the double jump after Jump Squat. Getting consistent in this method is really easy compared to Y>Z>Y but doesn't drop the turnip in front of her. 7 frame Qdrops give you a 36 fpt knitting cycle (.58333 sec), saving 16 frames over pull>throw each individual 'knit'. It takes 69% as much time as pull>throw, and you're getting to see 44.4% more turnips per second as compared to pull>throw. 1 frame late on the DJ makes it total 41. 2 frames late and you will not land. These are the 10 frame Qdrop (39 fpt, faster, see GIF below) and the 12 frame Qdrop (41 fpt, slower, easier/more common). Both drop the turnip in front of Peach. Just before an enemy respawn, this can help expand those 2 safe pulls to 3, or free up some extra frames for panning (see next section). Knitting is perfect for when you get a kill off the top. It builds on the split-second facial recognition Peach mains should have already. Improving that will improve your knitting efficiency and visa versa. Knitting helps force an approach if you're waiting out a PS transformation. I've have also had some success with it in the early stages of Samus bomb recovery, while waiting for her to get within throw range. The entire point of knitting is to enable us to 'play the odds' as often as possible. Every pull comes with an expected value (EV) of how much we will 'get out of it'. The normal turnips (duds) are our baseline (=EV), ie the expected 'return' on our 29 frame investment. Obviously we want to get as many +EV pulls as we can in our games. An unsafe/interrupted pull is -EV, meaning you should avoid them at all costs. All turnips last 141 frames = 2.35 sec in the air. Pulling an item is about .8% chance (~1 out of every 128). If you are unable to recatch well or don't regularly go for them when able, there is no point in trying to optimize your turnip game with knitting. Stop learning this weird technique and go work on recatching first. Without doubling or tripling the value we get out of each pull (especially our +EV turnips/saturn, but duds too) we waste our miniscule benefit gained from emphasizing playing of the odds. It will not help you to work on getting to a +EV pull faster if you cannot use it to its fullest already. Even if we can see more turnips-per-second with knitting, we never want to make pull we don't have to. The odds are NOT in our favor that we'll get something better, and its a waste of vital frames when the opponent is not dead. According to knitting theory, recatching as well as possible is 100x more important than actually incorporating knitting into your game. The goal of knitting, despite the name, is not to find stichface. If you find winky, the most common +EV turnip, its time to stop knitting immediately. Even if you have plenty of time before the opponent spawns, your search is over. Start focusing on your stage positioning for the incoming invincible foe. This is about as important as recatching. As stated above, an unsafe / incomplete pull is the only time a pull can give you negative value. Spending 29 frames to play an already low-odds lottery and then being damaged/comboed/killed is probably the worst investment you could make. Every single risky pull is giving free % to your opponent in a gamble to complete the FULL 29 frames (if interrupted on 28 or earlier, the turnip disappears). Even if you get hit as soon as the animation completes, there is still an additional chance that you'll drop the turnip in hitstun (no exact percentage, but it seems to be 1/10 of the times you get hit while holding a turnip). On top of that, if you luck out and retain the turnip/item, they're still getting a free punish before you can use that pull to defend yourself. This is a core principle to peach play that you end up breaking when first playing a new opponent, since there are many matchup/stage combinations where you need to test pulling in uncertain situations. This sense comes through trial and error and playing on the edge of your opponent's reach in neutral. Ideally you'll slowly learn which opportunities are barely safe (can buffer spotdodge/shield to avoid punish) or read openings specific to your opponent, thereby minimizing your number of -EV pulls each game. If you're unsure that its safe, don't pull! Using the general rule of getting extra value one out of every nine pulls, probability can help further predict the likelihood of getting the +EV pull you're looking for. 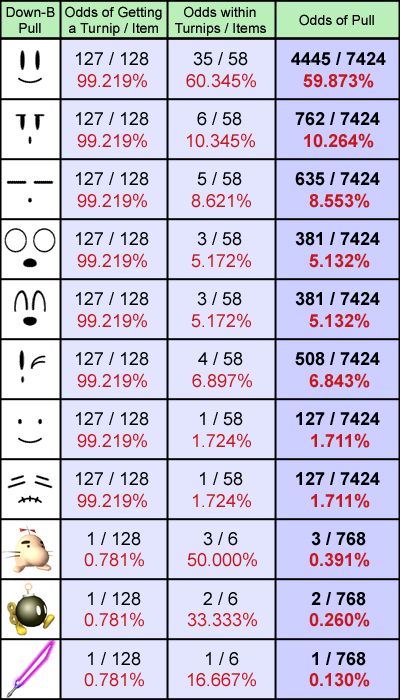 Each pull there is a 8/9 chance of getting a default turnip, so after two pulls (8/9 * 8/9) there is a 64/81 = 79% chance that you got a default turnip both times. This equates to a 21% probability that you get at least one +EV pull after two pulls. These may appear a bit optimistic at first, but become more reasonable once you start paying better attention to all the winkys you've been throwing away your whole life. Practice keeping track of how many pulls youve gotten in each game (takes some getting used to) or the gap between winkies/stitches. Sneaking in those extra pulls DOES make a difference. Items present Peach with a huge immediate advantage, its imperative to know how to capitalize with each the second she finds one. very strong shield breaker, plus people are used to shielding turnips. super combo when recaught, lasts the longest of all the items. try not to waste as an offstage edgeguard, throw him onstage to turn around instead if you can. feels like it has lower KB/scaling than a dud. I was tempted to make a rule about 'minimizing wasted turnip/item throws' but its a bit harder to codify in my opinion. Its clear that pulls that end up not connecting are not necessarily -EV. You could be controlling space, turning around midair, or covering an option. As a result this is more of an important facet of peach knowledge in general, and is independent of knitting theory. "Know when to hold em, know when to throw them, know when to pull again, know when to run." Whenever you have spare time (especially in the mus that utilize fsmash), cycle through fsmash until you get the frying pan. The game doesn't actually cycle through the three in order, it randomly chooses one of the remaining two weapons to use each time. In other words, you will never get two of the same weapon in a row. Now that you've used pan, either the club or racket will come out on your next fsmash, which both have slightly better range and (arguably) KB trajectory (frame data for all three is the same). The first fsmash of every stock is picked from the three randomly, so this effect does not persist through death.This technique has been known since 2005, possibly earlier. It is better in most cases to knock an opponent farther horizontally away with the club/racket and hope to set up an edgegard/gain space. Even if they are at high %, a frying pan will rarely kill (even when charged) and is awkward to act out of sometimes since they don't get sent a safe distance away. This, coupled with its slightly shorter range, makes it the weakest of the three in the matchups that I use fsmash the most in. In general, I find Fsmash is only worth using at maximum range anyway. One fsmash takes about as much time as a pull>qdrop or pull>throw, so you count it as one of your 'pull' attempts before starting to knit. Keep track of the last fsmash used, get good at reacting to them, and don't forget that the anti-pan effect goes away when you die. IMPORTANT: when waiting for opponent to spawn, DO ANY PANNING BEFORE KNITTING. Don't want to risk throwing away a +EV pull with a smash throw. Panning is new to me! That is a great idea! I think that is especially useful for edge guards. Being able to never get frying pan is great. Also if you get golf club you can go for up tilt forward smash on spacies. Both pan and racket are great for that as the person will either get hit straight up or miss the tech. I'm sure there are other applications too. Know when to hold em, know when to throw them, know when to pull another, know when to run. LMAO! :3 I wonder how many people will get that reference? [the] fastest Knitting method is Y>Y>Z. Which is 3 frames faster. Also easier in technique and having a 3 frame window to input the double jump after Jump Squat. Getting consistent in this method is really easy compared to Y>Z>Y but doesn't drop the turnip in front of her. The position of the turnip is determined by where she holds it. Regular jump has her arms in front of her and it takes 7 frames for her arms to be fully extended behind her. editing/updating the guide with this new info, thank you to @radiogiraffe for pointing this out. OP officially updated with new info! Thanks for the information! Right now I'm struggling the most to not light shield after the drop. Also, IMHO, sewing / sowing is even more clever of a term. This blew me away. A HUGE bravo and thank you. I'm still far from getting true benefits out of this tho. -After practicing Qdrop quite some time several times yesterday, I found out It's gonna take way longer for me to master it. Actually I'm still working on DJL alone, to dash away after I extended out of DD range, and to double jab out of a run (any other application I don't know of ?). So I'm gonna do things step by step I guess. -Whenever I get, say a stitch, I have a very hard time landing it. Should I play mind games, or always try to hit a FCaerial before ? I've been watching over and over again armada erasing whole stocks with a single stitch, but I still strugle way too hard to even recognize an opening when I'm holding a stitch. Is there any "guide" I should look for ? We would say "expected value", not "expectation value". Actually, how does z dropping plus float compare? With the drop either before the float or after. https://www.youtube.com/watch?v=VydVrK2VZ2kThis is a video that was posted on Youtube in 2006, the video would have been originally recorded even earlier. At around 0:13 I executed a Qdrop so that I could grab Bringer's Yoshi after shielding the Down B. 10 years later, it is still the only example I can point to where it has been done in a real recorded match. When I originally wrote about the idea, I was just starting to realise exactly how far the character could actually be pushed. Back then I didn't get much chance to travel and play competitively and so I spent a lot of time coming up with new tricks and ideas. DJL has been known for a very long time, I don't even know who is to credit for ideas such as using it OoS or platform insta-lands. I was always surprised though, that no one ever really seemed to get excited about what it actually meant. When Superdoodleman asked about ideas for his Perfect Control video, I suggested the idea that Peach could power shield a flurry of attacks and then DJL out asap to be able to Shield again. He made the clip with Falco and was impressed with how it looked in the end. I then suggested as a follow up idea, that it could be possible that Peach could powershield Fox's lasers and approach at the same time with DJL. Sure enough Superdoodleman delivered one of the most exciting pieces of footage of what 20XX Peach would look like in the Perfect Control video. But despite this knowledge being out there, it is sad to see that all these years later we still don't have any Peach players that are even using DJL OoS. The best we have got is some platform lands. Peach players have a lot to learn from the 20XX Fox players and the 20GX Falcons. There doesn't seem to be the same initiative on our end to not just theorise but also demonstrate the extremes the character can be taken. So I hope that when Peach players read articles like this, they don't once again dismiss this as too technical to be useful and miss yet another opportunity to take the character to the next level. @ Vestboy_Myst Thankyou for taking the time and effort to put together this outstanding post. The theory behind knitting is sound and well explained and the proposed applications are realistic. This tactic also has the added benefit of not needing to be performed in a pressure situation, such as shield drop aerials, so it should be easy to get practiced at it by giving it a go in between stocks. If you mess up then it's not that big a deal. Regarding panning, it seems like a necessary tactic if we want to even open up a discussion about when and why Forward Smash should be used. I would really like to see some Peach players show videos of them making use of these tactics in a real game. In fact I might even make a thread devoted solely to showcasing videos that demonstrate 20XX Peach stuff in real games. i'm going to spend a few more days compiling information and do a ton of work on the OP later this week. Any frame past 2 Frames airborne will result in her being too high to hit the ground and enter Wait state. Thank you for the kind words @ Quetzalcoatl , it means a lot. I think I was realistic in the guide when I said that knitting theory isnt a complete game changer. It is, however, very feasible and a straight up improvement over the current method. If you're looking for optimizations it only natural to try it out, and there certaintly isnt any harm in using it (again, only if used correctly). Therefore its only natural that the 20FC peach would use knitting whenever able. In reality I've found messing up (ie jumping) pretty treacherous depending on stage/mu, so I've started trying to knit below a platform in order to DJL to safety in case of an accidental fh. I never thought my like 30-40 minutes of screwing around in debug mode would come in so handy! I definitely appreciate the credit...if my data can help out this amazing peach guide i would be honored beyond all belief. not bad considering he only saw this guide about a week ago. stage placement and timing were perfect as a proof of concept, and he gets a stitch not long after the stage transforms. Yo, this isn't the same thing. This is what I was asking about in my previous post, where you use float to z-drop without going too far from the ground. I have been doing float drop pull for a while. It's basically just for style purposes. And recatch looks cool. It's not the most useful thing and not that easy. I only learned it because I thought it would have a use it didn't have. Is there any advice on doing this and not buffering lightshield? That seems to be my biggest obstacle while trying to learn this. I have the same problem with that method. The problem is I think you have to press z for one frame? floating and then dropping is slow compared to qdropping no matter how good you are at it. you might as well be pulling and throwing normally just to get the hitbox out instead of saving the very small number of frames you get.